In this Wealthy Affiliate review we will cover the program in detail. The VETTED OPPS team has spent well over 15 hours researching and writing this Wealthy Affiliate review. We used sites such as SiteJabber, TrustPilot, RipOff Report, and others to get an overall view of what people are saying about the program. Wealthy Affiliate support was contacted to check on response times. Plus, we also joined Wealthy Affiliate to give us better insight into how this program is run. Wealthy Affiliate is a unique program that teaches people how to succeed in making money online through affiliate marketing. It also teaches other ways to make money online but the main focus is affiliate marketing. 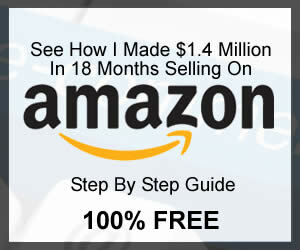 It has now grown to over 1.2 million members and we will cover the entire course in this Wealthy Affiliate review. Kyle Loudon and Carson Kim founded Wealthy Affiliate in the year 2005 and they have since grown the company into one of the largest affiliate marketing educational websites in the world. Wealthy affiliate got started with a group of Internet marketers and a selection of tools. When the two started the website it was their goal to share their information about running a successful Internet business and helping other entrepreneurs to grow more successful every day. They have always been passionate about helping anyone who is serious about running a successful internet business. The two have remained extremely professional and still remain quite active in creating new programs and answering questions on their own forums. In fact, Kyle is very active and responds to messages very quickly. This is something you rarely see with entrepreneurs who have had the success Kyle has had. Both men have continued to manage not only the Wealthy Affiliate but a variety of other ventures including Jaaxy keyword research and street articles which is a website publishing host. Kyle and Carson have an extensive business background in marketing and affiliate marketing. They are a wealth of knowledge and in almost any Wealthy Affiliate review their skills are celebrated especially when it comes to the insights that they provide to the community. The two founders have done very well financially but they still remain very passionate and caring about the community that they started. 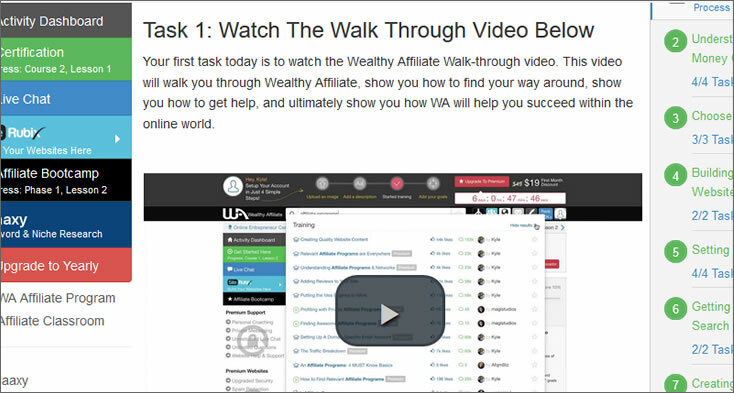 HOW DOES THE WEALTHY AFFILIATE WORK? The Wealthy Affiliate program is simply an online training platform to teach people how to succeed making money online in affiliate marketing. It also teaches several other methods to creating income. 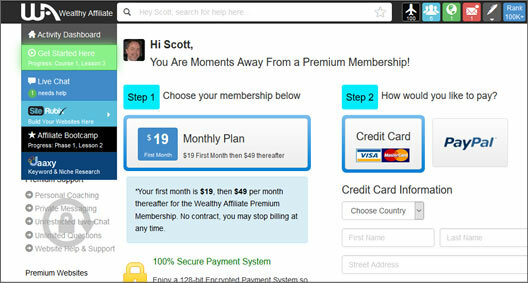 There are two levels of membership on the Wealthy Affiliate platform. The first is a free membership. Access to free training in the classrooms. Online Entrepreneur Certification (10 Lessons). Affiliate Bootcamp Training (10 Lessons). Classrooms, Evolving Daily (2 Classrooms). 2 free hosted websites for selling affiliate products. 3 days of access to member forums to ask questions. 3 days of access to live chat. 30 keyword searches for research each month. Free phase 1 of the Boot Camp course from the Wealthy Affiliate University. Online Entrepreneur Certification (50 Lessons). Affiliate Bootcamp Training (70 Lessons). 500 training modules + extra premium modules. Unlimited hosting for free websites. Hosting for 50 websites at no additional charge. Increased security package and website backup. Access to all 12 classrooms in the Wealthy Affiliate University. Unlimited live support on the forum. Every phase of the Wealthy Affiliate Boot Camp course. Commissions which are on average 100% higher than Wealthy Affiliate members who chose the free version. Private access to founder support. New benefits as they are added to the Wealthy Affiliate University for no additional charge. The premium version offers an extensive value for people that are serious about creating a strong business online. Kyle and Carson show the wealth of their knowledge to premium members and there are very little restrictions on these accounts as far as using all of the tools that Wealthy Affiliate offers. Premium membership is priced as of this writing at $19 for the first month and $49 per month after that. There is also a discounted yearly subscription. The annual subscription holders get access to all of the same features that the monthly paying premium members do only at a rate that is considerably lower. As many Wealthy Affiliate reviews will tell you, the live video classes and the forums are some of the greatest assets to this program. As far as the Wealthy Affiliate live classes go, this is where every premium member can truly see the benefit of their membership. Wealthy affiliate posts live video classes and training on very specific subject matter every single week. During this type of video class Wealthy Affiliate users can also check into chat to ask questions and communicate with other members on the status of the video. These types of live video chats and ongoing classes ensure that the Wealthy Affiliate program remains completely on the cutting edge. New concepts in affiliate marketing are introduced every week and then explained in a classroom style scenario so that the program continues to have an ongoing benefit to almost any type of user. As a member you not only gain access to all of the other tools like the site creator, keyword research tool and affiliate marketing resources in the forum, these live classes help to ensure that every Wealthy Affiliate member is regularly using all of the latest tactics to achieve the highest commission rates. Wealthy affiliate is offering a program that’s simple to follow and offering considerable value. 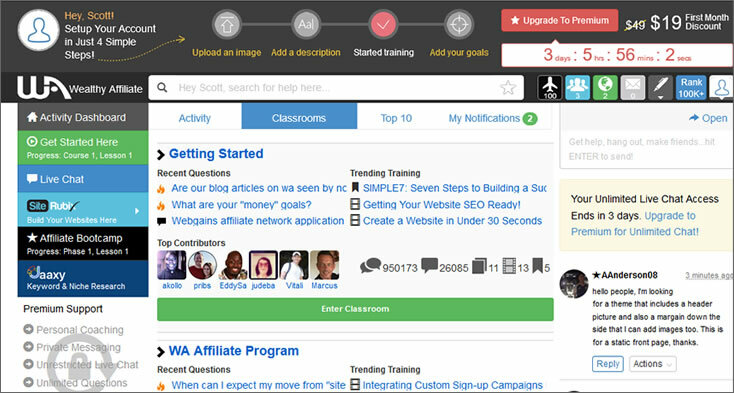 While many other affiliate programs only offer site tools and continued access to their original training programs, Wealthy Affiliate is continually evolving and adding new content that can help users to build on their success using modern techniques in affiliate marketing. WHAT DO YOU LEARN IN THE WEALTHY AFFILIATE PROGRAM? 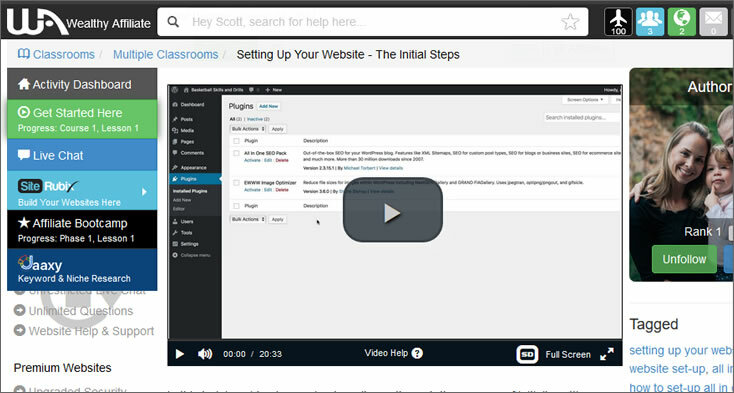 When you first sign up for the site you will watch a complete video guide to help you learn how to use the site. Once you learn your way around the site you can then begin your education in affiliate marketing using the 50 lesson course available to Premium members. Free members can access the first 10 lessons. This is called their “certification courses”. There is also another set of course called “Affiliate Bootcamp” and these are a set of 7 phases and 70 lessons in total. The goal of the program is to help you learn and master affiliate marketing and making money online. The first thing you will need to do is to pick a topic or niche that has an interest to you. It is best to pick a niche that you are passionate about as this will help to keep you interested long term. Through the site making tools called SiteRubix available in the Wealthy Affiliate program, you will build your own website around your chosen topic. You will then learn the latest marketing techniques and SEO tactics to succeed in affiliate marketing. This comes from the extensive library of teaching and the interaction you have with the 1.2 million member use base. 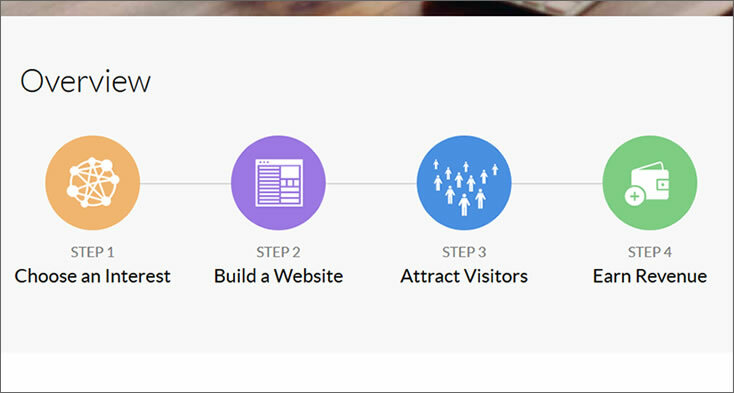 The last step is to learn how to earn revenue with your website. Several methods of site monetization are taught including affiliate marketing, Google Adsense, selling your own products and more. In order for us to be completely unbiased in this Wealthy Affiliate review, we researched several sites to see what other people were saying about the Wealthy Affiliate program. On the website called SiteJabber (which is a website where people can leave feedback), the Wealthy Affiliate program has received an over rating of 2 out of 5 stars but only from three users at the time of the writing of this Wealthy Affiliate review. 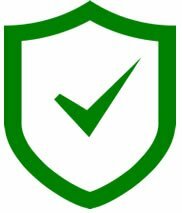 The TrustPilot site showed more positive reviews than negative with an overall rating of 4 out of 5 stars from 11 reviewers. There are many comments left on Ripoff Report and the views were mixed with positive and negative feedback. The overall view left by those posting a Wealthy Affiliate review is mainly positive. As with any program you’re going to have some negative reviews. It’s not possible to please everyone. However, most people who posted a Wealthy Affiliate review left positive feedback saying they did get a lot out of the program. The main complaint by users who posted a Wealthy Affiliate review on Ripoff Report was that they felt many reviews for the Wealthy affiliate program are “fake” and “misleading” and that reviewers were just trying to make money promoting the program. Others countered this by saying if people would just try the program and do what is taught they would see that it does work. Other negative reviews left on TrustPilot said the program was a nothing but a “social club” and that the company continues to “spam” them with emails. Overall a large amount of Wealthy Affiliate members are discovering that the webinars, the content and the materials that are presented in the program represent some of the best training programs available online right now on affiliate marketing. The overall feedback from members is overwhelmingly positive. We decided to sign up for the FREE Wealthy Affiliate membership so we could better educate ourselves to write this Wealthy Affiliate review. We later upgraded to the Premium membership to get a full view of the program. Once signed up for the free membership, the first thing we noticed is that the member dashboard was very confusing. There was just so much going on. On the left side of the page is navigation so we decided to enter the “certification course”. As a free member we had access to the first 10 lessons only. In the first lesson was a video by Kyle, one of the sites founders, which helped us learn how to navigate the site. It helped a lot. After watching the 10 free lessons in the “certification course”, it gave us a better grasp on what is available on the platform. The “certification course” was very good. It taught all of the basics one would need to know to get started in affiliate marketing. We then used the Jaaxy Keyword and Niche Research tool to look for keywords we might use to target on our website. This tool was truly one of the best we have used in doing keyword research. The next step was to take a few of the lessons included in the interactive classrooms. These are lessons posted by the founders and other members of the Wealthy Affiliate program. These classes are very informative but the best part is the amazing discussions going on in each classroom. Kyle, a founder of Wealthy Affiliate, is also posting quite often in the classrooms and forums plus he is a very active participant in discussions. It was important that we checked on support response times to see how long it would take to get an answer to questions. So we sent in a question to support and posted questions in the member forums. We received answers within minutes from support and from the member forums! Every time we tested this we would get responses within minutes! We also contacted Kyle, one of the Founders of the community and he responded within minutes! We have rarely seen a founder of a popular program actually respond to members. Live chat is a feature that is available on a limited basis to free members and unlimited to Premium members. This feature allows you to chat in real time with other members. We asked a question and would receive a response within minutes. The forums and community at Wealthy Affiliate are the most active we have ever seen anywhere! This is evidence that people are actively engaged with the site. SiteRubix is the site building platform offered exclusively through Wealthy Affiliate. It is basically a complete site building and hosting service built on the WordPress platform. Access to the SiteRubix Site builder was also available as a free member. We could build and create two free websites but had to use the siterubix sub-domain and not our own custom domain. After thoroughly checking out the free membership we upgraded to the Premium membership for $19 for the first month. 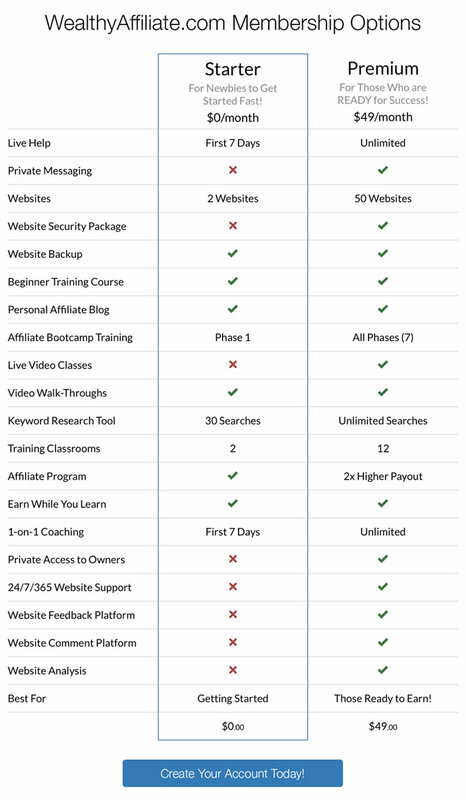 Premium membership unlocked all of the “certification course” lessons and “Affiliate Bootcamp” lessons. We found these lessons to be extremely educational and well worth the cost of the Premium membership. The teaching was top notch and we learned much more than we had known before about affiliate marketing. Access was also opened to every area of the site including unlimited chat, unlimited classroom lessons, upgraded website features (site speed, enhanced security, custom domains, and more), unlimited use of research tools. Our experience with the Wealthy Affiliate program has been nothing but positive. In fact, we can say with assurance that if you will apply what you learn in the program you will see tremendous progress. You won’t get succeed overnight, but, by applying what you learn, you can see success long term. From what we have seen much of the negative feedback comes from past members who really never put into practice what they were taught. The live training sessions which are updated weekly offering ongoing value. Live Q&A’s from the founders of the program. Webinars and live web feedback ensuring that users of all types can continually learn from the training. Diverse learning and training potential to the entire community. Excellent tools including the WA keyword tool and site builder. Forum access where you can interact with many passionate internet marketers who are very willing to help new members. Even if you are an experienced affiliate marketer or someone who is just getting started with working from home, the tools that are available in Wealthy Affiliate represent some of the best available online. The support and live help are available 24 hours a day and seven days a week offering some of the best levels of customer service from any educational program we have ever seen. The site is now extremely established with over 1.2 million users and well over 12 years of experience. 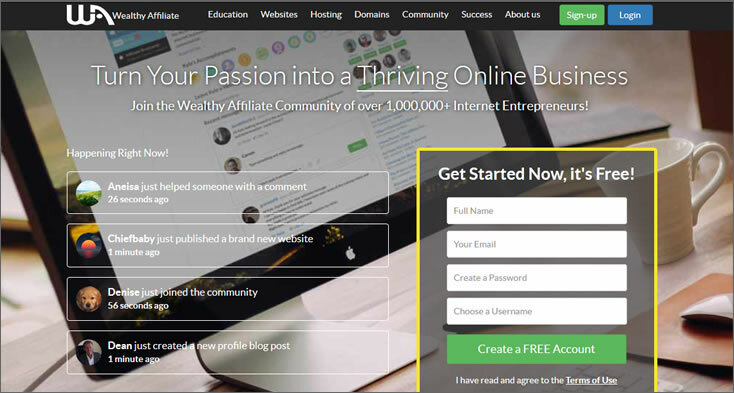 With such legitimacy, value and education all available in one place the verdict on this Wealthy Affiliate review is that the website itself is one of the best affiliate courses available. 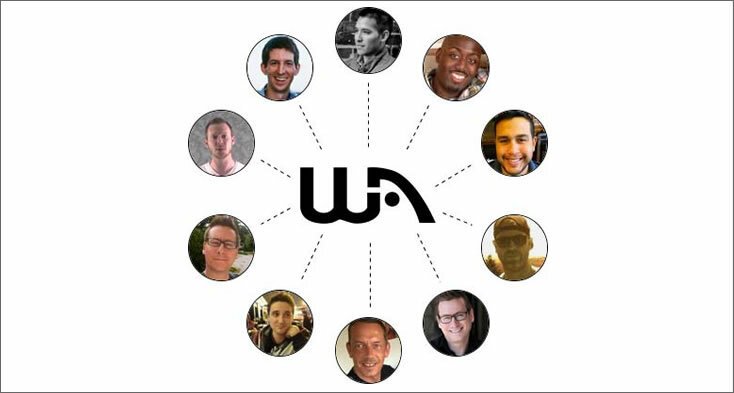 Wealthy Affiliate offers its members the best available teaching and guidance in the highly lucrative affiliate marketing industry. As a member, you will gain access to experts in the field and this is something not offered in other affiliate marketing programs. 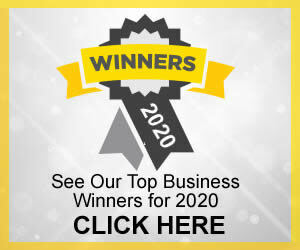 If you are serious about working from home or earning a living through affiliate marketing, you have got to check out the Wealthy Affiliate program today. The Wealthy Affiliate Program is one of our top two choices to learn how to make money online. If this is not for you then you might be interested in mystery shopping, learning how to sell products on Amazon, Bitcoin mining or in taking paid surveys. I have looked at other wealthy affiliate reviews and those sites seem to say something negative about everything except wealthy affiliate. In other words they are just directing people to wealthy affiliate to make money. After looking at your site I can see you offer honest reviews of every program good and bad. So I am confident finally that this review is an honest review of this program and I just went and signed up! Thank you for providing such valuable info and not being like so many others. Thank you Ruth! I am glad to hear that this post helped you make a decision. So sorry to hear you feel this. Why do you say this? I have had nothing but a great experience with Wealthy Affiliate. From the moment I joined it has been incredible. They have great courses which work “if you put it them into practice”, an unbelievable community of people, and the most current info I have found on the subject of affiliate marketing. Since I have had nothing but a positive experience with the program, I recommend them. My team and I only recommend opportunities we feel truly offer something of value to it’s members. Scott thanks for this review! I’m a new member at wa, 3 days and I’m loving it I’m 61 and even though I’ve lots of experience in my past career I feel most companies want younger associates they can groom. The people at wa really do want me to succeed. Again thanks for your research! Thank you for leaving your feedback! I’m in my 50’s and still going strong with making money online. It’s been 18 years and I love it. So glad to see you’ve made the decision to start. I’m also glad to hear that you’re getting a lot out of your membership with Wealthy Affiliate. I agree, they truly do want you to succeed and the community is incredible! Anytime you need help others are right there to help.